Seagull vs Cardinal | Tennessee Aircraft Services, Inc.
A first time customer calls me to describe a “minor” bird strike on the forward top of the left wing of his Cessna 177B Cardinal. A seagull made a glancing blow to the top of the wing about 4 inches aft of the leading edge and 3 feet out from the cabin. It only deflected the skin down about ¼ of an inch. The plane arrives on the ramp at our shop and draws several of the local pilots walking around to see a really sharp Cardinal. In all the scrutiny over about a week’s time, no one notices the damage. I challenge a few to find any “flaws” in the sheet metal of the plane with no success. The seagull impacted the top of the left wing. The ensuing telephone conversation with the owner includes my description of the internal structure of the wing and concern for deeper structural problems. Complicating the issue is the damage includes the fuel cell area. With such seemingly minor damage, how do we get to such a major repair? The FAA doesn’t define “major damage” or “damage history” because they have little relevance in the regulatory world. The aviation market however, is glued to concern with damage history but has no universal description of just what that is. The industry’s definition is as varied as the people asked. To the point: determination of damage history has more to do with whether viewed by the seller or the buyer. In my line of work, airframe damage history in any form is immaterial if repaired properly and no different than repairs to an engine or propeller. The FAA does, however, define “major repair.” Their words are found in FAR 43 Major Alterations, Major Repairs, and Preventive Maintenance, Appendix A – paragraph (b). It’s not so much a definition as a description by example. Subparagraph (1) for airframe major repairs states: “Repairs to the following parts of an airframe and repairs of the following types, involving the strengthening, reinforcing, splicing, and manufacturing of primary structural members or their replacement, when replacement is by fabrication such as riveting or welding, are airframe major repairs.” A typical long run-on sentence with debatable meaning, possibly written specifically to irritate mechanics. Following subparagraph (1) is a list of aircraft parts to which it applies. Also notice in subparagraph (1), the FAA makes no reference to the extent of the damage, only the extent of the repair. For the FAA, it’s not how bent the airplane is but what is done to repair it. A slight ding on the edge of a wing skin might only need a bit of filing to dress it out and return the aircraft to airworthiness with a log entry as a minor repair. The same minor ding repaired by splicing in a new section of skin most likely qualifies as a major repair. The same ding could also be repaired by replacement of the entire wing, which is a simple bolt on affair requiring only simple hardware and just as simple log entry. Which one of these qualify as damage history? So, we peel the wing skin off the Cardinal wing to see how bad the hurt is. After all the tank sealant is removed from the skin and the underlying structure, the bent forward spar is exposed. The surrounding area is inspected closely for any sign of extended damage and everything else looks good. The little dent in the skin caused enough stretch in the aluminum that it can’t be straightened, so replacement is in order. The top flange of the forward spar is bent down about ¼ inch, but replacement forward spars have never been available from Cessna. Some kind of repair must be made to the spar. Depending on how the previously stated Part 43 Appendix A paragraph (b) subparagraph (1) is read, the skin replacement may or may not be a major repair. If one considers the skin a primary structural member, this is a major repair. If not, then the forward spar would surely qualify so we’re still stuck with a major repair and the required completion of an FAA Form 337. The 337 form will be filed with the FAA and become a permanent part of the aircraft’s records. Major repairs require FAA approved data which might be in the airplane’s service manual. The restart Cessna’s have a separate Structural Repair Manual but that data won’t apply to the cantilever winged 177. Unfortunately, the structures section of the Cardinal service manual specifically states “ no repair to the forward spar.” FAA Advisory Circular 43.13- 1B change 1 Acceptable Methods, Techniques, and Practices – Aircraft Inspection and Repair may also be used as approved data, provided its information is directly applicable to the planned repair and does not contradict the manufacture service manual. Now we can add the services of an FAA Designated Engineering Representative (DER) to our list of requirements. A DER is an engineer FAA authorized to generate approved repair designs in his special field of expertise. 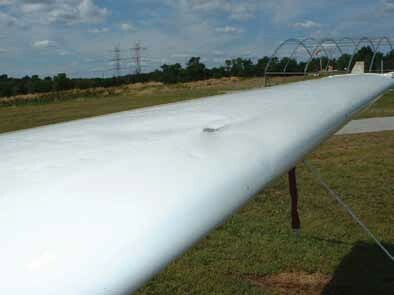 In this wing repair, the job is to return the original strength while retaining the same flexibility. Slapping on a big steel plate would easily get the strength but would create localized stress points at the ends of the repair. In our case the spar is reworked to its original shape as gently as possible to avoid creating cracks. A tapered stiffener is mounted on the forward face of the spar with a flange on top. Another slightly smaller stiffener is fabricated and installed on the aft side of the spar in the fuel bay area. These two aluminum plates sandwich the original spar, thus maintaining its proper shape, and their tapered ends minimizelocalized stress areas. Before anything gets reattached, the wing is secured in a “jig” to maintain its shape. A jig could be a special made structure in which the wing may be mounted to maintain its shape while work is being performed. The same effect may be achieved by using the aircraft as part o f the jig. The aircraft gets set with jacks and a tail stand for stabilization. Supports are then custom fabricated to hold the wing in proper alignment and twist. String lines can be used to verify straight alignment on the spar and leading edge. A simple tool and procedure for the checking wing twist is found in the 177 Service Manual Section 18 Structures, figure 18-2 of the service manual. The cantilever wings on the 177 have a constant twist from the first rib inboard to the tip rib. The tank skin is large enough that when removed allows the wing to easily twist 5 to 10 degrees by applying hand pressure at the wing tip . It is critical to get this twist and overall alignment set at the very beginning and maintained throughout the work progress. Since this repair also includes work in the fuel bay, the mating surfaces of the stiffener plates are coated with tank sealant as they are installed. The new skin is installed with sealant applied between it and the wing structure to make a bond and promote an ideal seal. A lot of work must be done to get the skin ready for riveting. The new skin comes from Cessna as a blank aluminum sheet bent in the shape of a leading edge. All of the rivet holes, inspection panel holes, and edges must be custom cut and trimmed This is done in a combination of laying the skin on the jigged wing and matching it with the original skin as a template. This is not the time to get in a hurry as the skin may get set on and off the wing several times to ensure perfect alignment. The new tank skin gets fitted, drilled, dimpled (for the flush rivets), and primed in the areas outside the tank. Final installation and riveting is a messy event with limited working time due to sealant cure rate. Normally, a skin is temporarily attached with removable fasteners called clecos, during the riveting process. Old dimpled rivet holes are too large for clecos to hold well, so an alternative must be used. In the tank area, we use small screws with plane nuts to gently pull the parts together. Sealant squishes out all over the place, letting us know all the important spots are covered. The wing is left overnight allowing the sealant to take a set. The next day riveting begins. Wet sealant is not only a mess to work in, but also acts as a lubricant between the rivet and the bucking bar, eliminating needed friction for good rivet manipulation. After the sealant takes a set, the nuts are removed from the screws, leaving a very neat clean spot for the shop end of the rivet. Rivets can be set and inspected without being covered in sealant goo. After all the riveting is completed, the tank gets a final touch of sealant on the rivet tails. All the nooks and crannies in the tank get a smoothing over as well. The access panel is installed using a low adhesion sealant to aid in any future removal. The tank gets pressured with ½ p.s.i. nitrogen and checked for leaks. If no leaks are noted, the tank is filled with avgas for the final real world leak check. As we have seen, it doesn’t take much damage to create a major repair event. Generally speaking, if pressed, I quantify damage history as impact damage requiring a major repair. I might include corrosion repairs if certain structures of the plane were included. But I’m not the buyer, seller, broker, or appraiser. I’m just the mechanic, and quality of repair is way more important to me. When purchasing a plane, a personal search through the records is the best way to find anything that fits your description of damage history. The reason for the major repair, or any repair, is rarely noted in the records so some reading between the lines is in order. Is it enough to give you pause during a purchase?